11.4 gram Dan El Shekel Silver Coin | ?? Get your historically accurate piece of silver from our online store today. The Shekel is the oldest weight known to man. Weighing in at 11.4 grams the Argor-Heraeus produced Dan El Shekel coin is sure to grab your attention with it's stunning beauty captured and preserved in a plastic certi-card. The obverse of this Great Hall of Faith coin depicts Abel tending to his flocks. On the reverse side you will see the phrase " Commonwealth of the body of Christ" centered around a crest which symbolizes the verse from Ephesians chapter 6 involving putting on "the whole Armour of God". This is a hard to find item that is based both on a historic, and biblical currency. Ensure you don't miss out and get yourself a 11.4 gram Dan El Shekel Silver coin today before they all sell out. 正面 The bible character Abel tending to his flock. 反面 The phrase " Commonwealth of the body of Christ" centered around a crest representing "the whole Armour of God". The bible character Abel tending to his flock. The phrase " Commonwealth of the body of Christ" centered around a crest representing "the whole Armour of God". 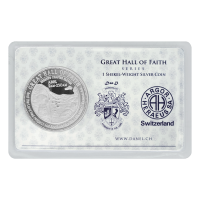 11.4 gram Dan El Shekel Silver Coin Get your historically accurate piece of silver from our online store today. The Shekel is the oldest weight known to man. Weighing in at 11.4 grams the Argor-Heraeus produced Dan El Shekel coin is sure to grab your attention with it's stunning beauty captured and preserved in a plastic certi-card. The obverse of this Great Hall of Faith coin depicts Abel tending to his flocks. On the reverse side you will see the phrase " Commonwealth of the body of Christ" centered around a crest which symbolizes the verse from Ephesians chapter 6 involving putting on "the whole Armour of God". This is a hard to find item that is based both on a historic, and biblical currency. Ensure you don't miss out and get yourself a 11.4 gram Dan El Shekel Silver coin today before they all sell out.